offering you the opportunity to complete your quilt by quilting it yourself. • Quilting with a longarm takes less time than on a home sewing machine. • Quilting on a longarm opens up more design possibilities because you can see more of the quilt. • Quilting on a longarm is ergonimically better than pushing and pulling a quilt around the small throat of a home sewing machine. • If you have ever wondered if owning a longarm or a computer guided system would be the right option for you, renting time quilting your own quilt will give you an opportunity to check it out. GET READY, GET SET, QUILT!!! How do I prepare to Rent Time? 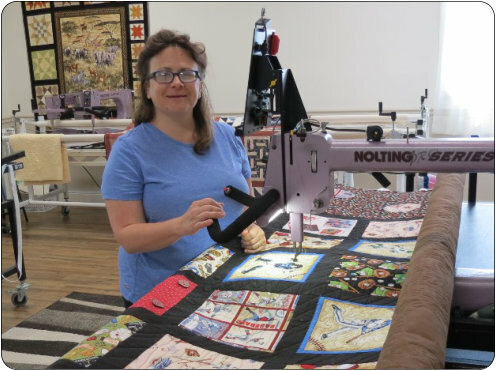 • Take the required Longarm Prep class: o Learn how to prepare your quilt for longarm quilting o Learn how to use our Nolting machines o Class costs $35 - More Info • Reserve quilting time - call well in advance of the date you would like and make a reservation. o Renting time on our Nolting machines is by appointment only. 585.226.2577 o Because quilts cannot be left on the frame over night or until another day, please ask for help in scheduling enough time to complete your quilt. • Preparations to make before arriving for your appointment: o The quilt backing should be pinned to the two backing zippers and ready to load onto the frame when you arrive. Since we “float” the top, nothing needs to be done with the top. o Bring your own batting or purchase from us. We carry high quality Quilters Dream batting and have many sizes and types in stock. If you plan on purchasing from us, please let us know what you want when you make your appointment so that we make sure it is on hand for your quilt date. Costs to Rent Time • You must purchase a set of zippers, $24.95. These will be yours to take home and pin the backing to prior to coming to your rent time appointment. If, in the future, you do not want to rent time, we will consider buying the zippers back if they are in good condition and not damaged. • Cost to rent time: $22 per hour o Time is calculated from the sign-in/sing-out sheet. If you are here all day and want to take a lunch break, there are several fast food and moderate priced restaurants in Avon, 2 miles away. Time for all day would not include a lunch break. o The rental cost includes the thread. We have a selection of many colors and types of thread that we know work well on our machines. If there is a specific thread color you know you want, please mention it when you make your appointment. We want to make sure we have what you need on hand. • Pantograph pattern use is $2. Charging a small amount to use one of our pantos helps us defray the cost and to purchase other patterns. We have a nice selection of patterns that would look good on nearly every type of quilt. Questions about Renting Time • What if I need help? o Someone will be in the studio the entire time you are quilting to assist with loading, winding bobbins, advancing the quilt, and to answer any questions. • What if I don’t finish my quilt? o Quilts must be removed from the frame at the end of your quilt session, even if it isn’t finished. You will need to schedule another day to return to finish quilting. “I can’t say enough about Joyce and Delightful Quilting. The studio is convenient, bright, open and spacious. Joyce is a fabulous lady . . wonderful TEACHER. She’s consistently very patient, very encouraging, excellent at explaining things, helpful in correcting mistakes, and good at gauging a learner’s pace. I am sooooo happy with both my quilt and my growth!! Heather B.
your quilt by quilting it yourself. Advantages to renting time: • Quilting with a longarm takes less time than on a home sewing machine. • Quilting on a longarm opens up more design possibilities because you can see more of the quilt. • Quilting on a longarm is ergonimically better than pushing and pulling a quilt around the small throat of a home sewing machine. 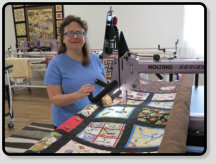 • If you have ever wondered if owning a longarm or a computer guided system would be the right option for you, renting time quilting your own quilt will give you an opportunity to check it out.